Women clergy members gathered outside of the U.S. Customs and Border Protection headquarters Tuesday in D.C. to protest the president's immigration policy. 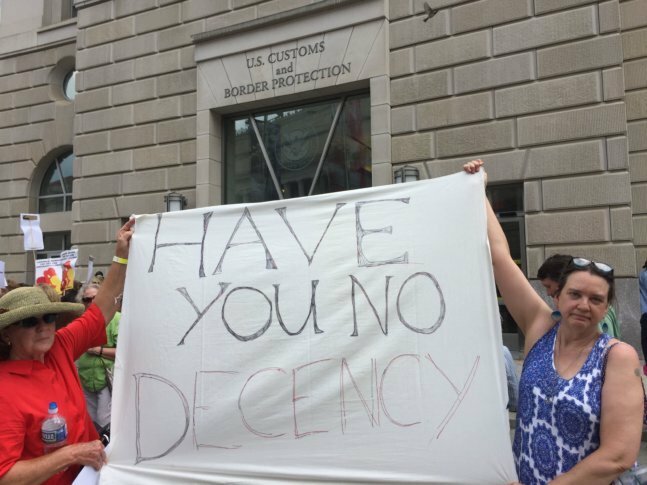 WASHINGTON — Women clergy members gathered outside of the U.S. Customs and Border Protection headquarters Tuesday in D.C. to protest President Trump’s immigration policy. Close to 200 women gathered there to voice their opposition to the separation of parents and children at the U.S border. The group chanted “let the children go … now” and spoke against Trump’s “zero-tolerance” immigration policy. The administration’s policy has taken 2,342 minors away from adults who were arrested trying to come into the U.S. illegally between May 5 and June 9, according to Homeland Security officials. The demonstrators said they’re sending a letter with thousands of signatures to Department of Homeland Security Kirstjen Nielsen. Families Belong Together is planning protests in D.C. and across the country on June 30 to bring attention to the policy.